Scelles Amphitheater (right side entrance). bus number FIVE (to Erasme). There is ample parking available. -Methodologies for the study of film soundtracks. Proposals in both English and French are welcomed. and a list of technological requirements (overhead, powerpoint, etc). Program committee: James Deaville (Carleton University, Ottawa, Canada), Laurence Le Diagon-Jacquin (Université de Rennes 2, Université de Bourgogne), Michael Saffle (Virginia Tech, Blacksburg), Emile Wennekes (Utrecht University). For the fifth annual conference of MaM, we fruitfully joined forces with the Faculty of Arts and Social Sciences of Carleton University, Ottawa (Canada). After the previous conferences in Amsterdam, Berlin, Lisbon and Turin, it was the StG’s first gathering in North America. The focus of the international three day conference (11-13 July) was on “Music on Small Screens.” Over the course of the last two decades, the dominance of the large cinematic screen has gradually eroded in favor of smaller formats for the consumption of screen media. In recognition of this development, therefore the 2013 MaM gathering focused on the theme of music on small screens. The subthemes of the conference were (Popular) Television Music; Music in Children’s Television; Television Musicals; Video Game Music; YouTube Music; Classical Music in Screen Media; Video Games and Opera; Theories of Television Music; Performance in Video; Creating Digital Media; Music for Television Series; Small-Screen Musical Paratexts. The program committee consisted of James Deaville (Carleton University), Claudia Gorbman (University of Washington Tacoma), Anahid Kassabian (University of Liverpool), Michael Saffle (Virginia Tech), Paul Théberge (Carleton University), Emile Wennekes (Utrecht University). 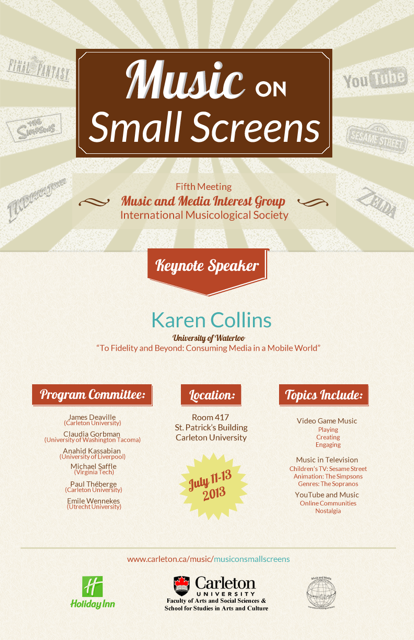 As a result of the conference, Ashgate is planning to publish a book with selected papers on the conference theme in its Music on Screens series. The MaM VI conference will most likely take place in early summer, 2014 at the Université de Bourgogne (Dijon, France). 2013: Carleton University, Ottawa, Canada. Emile Wennekes: With Screens, Size does Matter. Kenneth DeLong (University of Calgary), “‘And the women wicky wacky woo’: Music as Trans-National Comedy in the Jeeves and Wooster Series”. Ben Winters (Open University UK), “Idolising the Score: Indiana Jones Paratexts on the Small Screen”. Concluding Discussion, led by Emile Wennekes (Utrecht University). 2012: Università di Torino / University of Turin, Italy. Local host for this conference was Prof. Dr. Luisa Zanoncelli. The program committee was composed of Gianmario Borio (Università di Pavia), James Deaville (Carleton University), Anahid Kassabian (University of Liverpool), Michael Saffle (Virginia Tech), Emile Wennekes (Utrecht University) and Luisa Zanoncelli (Università di Torino). Following an international Call for Papers, the committee selected the proposals of 32 scholars from Europe, North-America and Asia for presentation. Prof.Dr. Claudia Gorbman delivered a well-received keynote. Some 60 scholars attended the two day gathering, which included a leisurely finale in the form of a guided tour through the fascinating Museo Nazionale del Cinema. Guido Heldt (Univeristy of Bristol), “The Song Inside: Metadiegetic Music or Focalisation?”. Ilario Meandri Sanchez (University of Turin): From the Marvelous to the Anti-Music: Film Music Clichés and Formulas in an Ethnomusicology Perspective”. Tobias Pontara (Uppsala University), “Bach at the Space Station: An Attempt to Mind the Gap in Andrei Tarkovsky’s Solaris”. Gillian Anderson (University of Illinois), “D.W.Griffith’s Intolerance: Revisiting a Reconstructed Text”. Hon-Lun Helan Yang (Hong Kong Baptist University), “’Heard Melodies’ and Womanhood: Cover Songs in Cantonese Movies of the 1960s”. Keynote: Claudia Gorbman (University of Washington Tacoma), “Music and Character”. Rubén López-Cano (High School of Music Catalonia)/ Úrsula San Cristóbal (University of Milan), “’Ars video’: The Short Music Video in Early and Classical Music”. 2011: Universidade Nova, Lisbon, Portugal. Pedro Rodrigues, Pedro Roxo, Hugo Silva and João Ricardo Pinto (INET-MD), “Research in Music, Sound and Moving Image in Portugal”. Martin Knust (University of Stockholm), “Film better than Concert Hall? About Hugo Alfvéns Music for the Film”. Yayoi Uno Everett (Emory University), “From Nixon in China to Doctor Atomic: Repetition and Myth in John Adams’s Operas”. Keynote Speaker: James Deaville (Carleton University), “Television Music Studies: Past, Present and Future”. Gaia Varon (University of Bologna), “Performing Performances: Some Considerations on the Role of the Filming and Recording Crews in Classical Music Videos”. Screening of Natureza Morta [Still Life], film directed by Susana de Sousa Dias, 72 min, Portugal, 2005. Marco Cosci (Università degli Studi di Pavia-Cremona), “Audiovisual Recurrences in Time: Alain Resnais’s L’année dernière à Marienbad‘. Keynote Speaker: Anahid Kassabian (University of Liverpool), “Smartphone Apps and the Environments of the Future”. 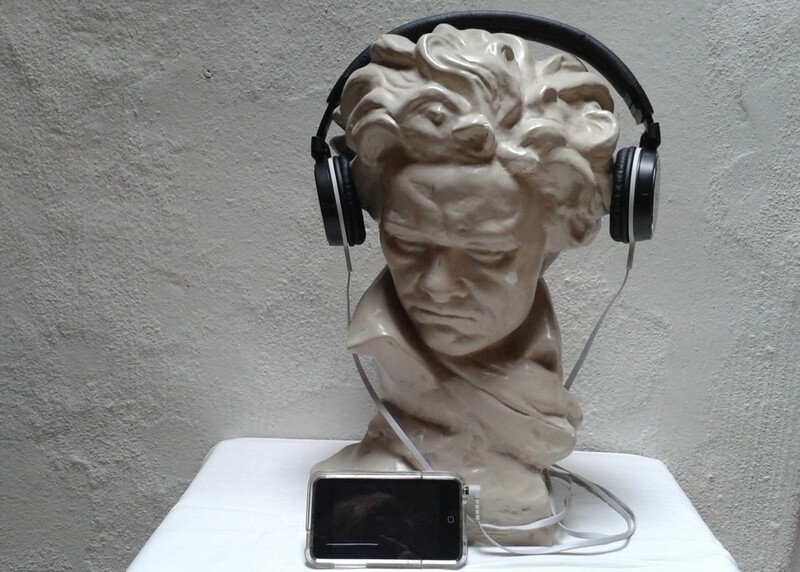 Consiglia Latorre (Instituto de Cultura e Arte da Universidade Federal do Ceará), “Song and Technological Mediation – Epoch Listening as a Methodological Proposal for Diversified Musical Reception’. Anahid Kassabian, James Deaville, Emile Wennekes, Manuel Deniz Silva. 2010: Humboldt University, Berlin, Germany. The second MaM conference took place at the Institute for Musicology and Media Studies/Institut für Musikwissenschaft und Medienwissenschaft, Humboldt University, Berlin, on 26-27 June 2010. There were three keynote lectures (Helga de la Motte, Philips Auslander and Michael Saffle), and 23 other presentations. Papers were grouped into themed sections: Virtual Worlds, Performance and Technology, Politics, Film and Radio. The presentations included work by three research groups, from Belgium, Italy and Berlin/Potsdam respectively, and 14 participants attended the workshop “Multimedia Art and Performance” (this outside the five instructors and professional musicians involved). Speakers were from Belgium, Canada, France, Germany, Italy, the Netherlands, Northern Ireland, England and the United States. There were 60 registered participants at the conference. The meeting was funded by the DFG, the European Network for Musicological Research and the Humboldt-Universitäts-Gesellschaft. Keynote: Helga de la Motte (Technische Universität Berlin), “Multi – Intermedialität: Veränderungen des Musikbegriffs”. Minkyu Kim (Hochschule für Musik, Freiburg), “Halluzination for Violin, Clarinet and Piano, video images by Peter Weiß”. Michael Liebe (Universität Potsdam) / Georg Spehr (Universität der Künste Berlin) / Dennis Mathei (Ruhr-Universität Bochum), “Spiel die Musik”. Gianmario Borio / Elena Mosconi (University of Pavia), “The research group Worlds of AudioVision”. Felipe Hickmann / Pedro Rebelo (Sonic Arts Research Centre, Queen’s University Belfast), “Audiovisual strategies for rendering presence in networked music performance”. Jens Papenburg / Tobias Plebuch (Humboldt Universität), “Shaping His Master’s Voice: Post-Production of Classical and Popular Music”. Keynote Philip Auslander (Georgia Tech), “Jazz Improvisation as a Social Arrangement”. Lydmila Symonova (Universität Freiburg),”Verhältnis vom Sichtbaren und Hörbaren in der Produktion des 1. Zustandes von Wolfgang Rihms Séraphin mit Video-Bildern von Klaus vom Bruch”. Gayle Wald (George Washington University), “Soul! TV: Music and Media in the Era of Black Power”. Melissa Wong (University of Cambridge): “All’s Fair in Love and War: Herrmann vs. Addison in the Case of Hitchcock’s Torn Curtain”. Keynote Michael Saffle (Virginia Tech), “Lisztomania: The Real Musical(ized) Story”. Simone Christine Münz (Universität Göttingen), “The Role of Music in Radio Broadcasting from the Cuban exile community in Miami/ Florida to Cuba”. Peter Niedermüller (Johannes Gutenberg-Universität Mainz), “Beyond Hollywood. Music, Sound and Signs in David Lynch’s Blue Velvet”.